LOS ANGELES -- The heavyweight bout at this year's Los Angeles show took place in West Hall of the Convention Center in the entry level SUV class. On the left, just inside the door, was the new 2012 Honda CR-V, California's top selling vehicle and a perennial contender for leadership in the category nationally. On the right, just across the walkway past the Lincoln display, was the 2013 Ford Escape, the 2011 national sales leader in the segment, but a distant also-ran in import-dominated California. Until now, the Escape stayed close to its boxy SUV roots design-wise, while the CRV has adopted a more contemporary look. 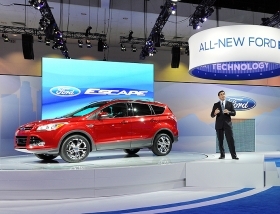 But Ford has gotten much more aggressive with the sleek, European-designed 2013 Escape it debuted here. It's loaded with technology, including a sensor-operated electronic rear liftgate, and is the first Ford to be offered with two EcoBoost engines. Jim Farley, Ford's group vice president of global marketing, sales and service, is one of the most hyper-competitive people in the industry. A warrior at heart, he clearly relishes the mano a mano competition between the two vehicles. Asked how he thinks the Escape stacks up against the CR-V, he replies with a broad smile: "Pretty darn well." Eric Loeffler, global chief engineer of Escape, walks up and tells Farley he has given the CR-V a good once-over. He tells Farley Honda has done some "subtle things" with the vehicle, but that Honda has used some hard plastic materials on its instrument panel. Says Loeffler: "Our interior is much more luxurious." Farley spent nearly two decades at Toyota and Lexus. He knows Honda is a formidable adversary. "They have a really loyal owner base. I'm sure none of those people will want to look at another brand." Is there a touch of irony in Farley's voice? The twinkle in his eye indicates there just might be.